American playwright Annie Baker has been dividing audience opinion since she wrote the three hour long, Pulitzer prize-winning The Flick, which was critically acclaimed but apparently had some audience members walking out in boredom. Ms Baker tends to write a lack of dialogue that puts Pinter’s pauses to shame. I went into John, her new three-hour production at the National Theatre, expecting a long, tedious evening. Instead I was completely mesmerised and could not wait to see what happened next. John is set in a bed and breakfast and also deals with guests interacting with their hosts. However, the similarity ends there as John is a much more humane and spiritual tale about relationships and how we connect with the people in our lives. Mertis runs a bed and breakfast on the outskirts of Gettysburg, Pennsylvania which could be considered quaint if it weren’t for all the dolls lining the walls, staircases and any nook that can be found. A Christmas tree is already displayed despite it being only one week after Thanksgiving. The breakfast area is named Paris, and decorated like a French café with croissants for breakfast. Into this strange world comes Jenny and Elias, a young couple from Brooklyn who are stopping over on their way from Ohio. We sense from the start that all is not right, as prickly Elias seems to be constantly picking an argument with Jenny, yelling at her from upstairs, or demanding to know if she hates his loud eating and then accusing her of anti-Semitism. He is intent on seeing all the historical sites Gettysburg has to offer, while Jenny has to duck out due to debilitating period pains. After an aborted trip around the town, Elias goes off on a ghost tour of a cemetery, leaving Jenny alone with the sympathetic but unusual Mertis. It is at this point that we start to learn more about who these people are. Mertis has a husband, George, whom we never see, as he is too ill, of what we never find out. Jenny writes questions for a quiz show. Mertis kindly invites Jenny to join her for dinner with her blind friend Genevieve. After much wine is drunk, more revelations emerge, but always eked out throughout the play, emerging naturally as the characters eventually feel like revealing them. Although it sounds like not much happens, everything happens as we discover the truth about Elias and Jenny’s relationship, hear about her dread fear of her childhood doll Samantha, a replica of which sits on a shelf in the bed and breakfast. Mertis asks both Elias and Jenny separately if they ever feel watched, to which they both have very different responses. This is a house which may be haunted, as Christmas tree lights mysteriously turn on and off and a player piano spontaneously bursts into song. And why won’t Mertis let the young couple sleep in the Jackson room? The cast are nothing less than extraordinary. American actress Marylouise Burke who plays Mertis is a highly-experienced stage performer who is completely unknown here but won’t be after this. She embodies the elderly and quirky Mertis so completely in her every move and slightly sing song way of speaking. We are fascinated watching her slowly climb the stairs or set breakfast, happy in her routines, yet clearly harbouring so much more beneath the surface. June Watson is superb as the caustic and outspoken Genevieve, who may be a bit psychotic or a bit psychic, it’s never clear which, but it is unimportant to her friendship with Mertis who accepts her as she is. Tom Motherdale as Elias and Anneika Rose as Jenny were also excellent, inhabiting the moments of silence as much as the words in their painful interactions with each other. This production feels like an interactive experience where the audience is totally immersed in the world of the play, drawn in bit by bit through clues about the characters’ lives, droplets of information said in passing or blurted out suddenly. This is theatre at its finest, don’t miss it. To book tickets click here or call 020 7452 3000. Image: JOHN (Anneika Rose as Jenny and Tom Mothersdale as Elias). Image by Stephen Cummiskey. My 19 year old dual national daughter doesn’t get it. She was born and raised in Britain but has always been an American citizen through me. Indeed, this was the only passport she held for the first 18 years of her life. Last year, she finally applied for, and received her British passport. She can’t understand why I still haven’t gone for mine. I can’t fully understand it either. It seems I have some strange emotional block in taking this final step. I came over to the UK when I was 20 years old. At the time I hadn’t intended to stay, but life took over and 36 years later, I’m still here! ”You have lived here longer than you have in America.” She says to me “Why don’t you just do it?”. As I search for an explanation I find myself fumbling with the answer, that maybe it has to do with spending my childhood pledging my allegiance to the American flag. She finds this odd, as kids in England don’t have an equivalent ritual. I describe how every morning at school my classmates and I, hands on heart, recited this pledge. Yet, nowhere in the Pledge of Allegiance did anyone ever say “I pledge my allegiance to the flag of the United States of America and any other country that I happen to somehow end up living in one day”. I tell my daughter that for me, it feels disloyal to take another citizenship. “Well then, isn’t it disloyal of you to be living here?” she asks. She has a point. So I say, “Perhaps, in my head, I’m sort of balancing it out by holding on to my sole nationality and passport.” That is the crux of it. My instilled sense of loyalty from my childhood is the impractically sentimental reason why after 36 years, I still hold only an American passport with indefinite leave to remain (ILR) in Britain. I was curious to see if I was alone with this feeling, so have been talking with a few other American expats settled in Britain. Cate Linforth is originally from Chicago and has been living in the UK for over 12 years. She came to the UK for University. Now, married to a Brit, she finally decided to apply for British citizenship in April 2017. She tells me: “I’d been struggling with the decision ever since I got my ILR back in February 2013. Part of me didn’t want to get it because of the amount of money I’d already paid to the Home Office, and I didn’t technically NEED to. However, once I met my now husband and started to realise that I didn’t really have any intention of moving back to the US, I decided that it made sense to think about citizenship, not least because of the recent change in politics in the UK, as well as Brexit. It no longer made sense to be living and working in the UK, but not having any say in political changes happening over here”. Cate goes on to say that she had to fight to stay in the UK because of changes in legislation. She explains “I think that previously I’d thought that under my ILR I was invincible, but the reality is that if I had to move out of the UK for 2 years, for whatever reason, and wanted to return to the UK, I’d be back to starting point.” I had asked her if applying for dual nationality brought up any mixed emotions, and she tells me “I think even now I still struggle with the idea of being a British citizen. I’ve never been particularly patriotic, but something inside of me, valid or not, thinks that if I become a British citizen, it would almost make me less American. I’ve been losing my accent gradually over the last several years, no longer easily tan (hello permanently pasty skin!) and not least I really struggle to identify with the general populous sometimes in the US, but I had a real internal struggle about what it would mean to get my citizenship”. I completely identify with the thought that Linforth Family somehow obtaining a British passport could make one feel less American. 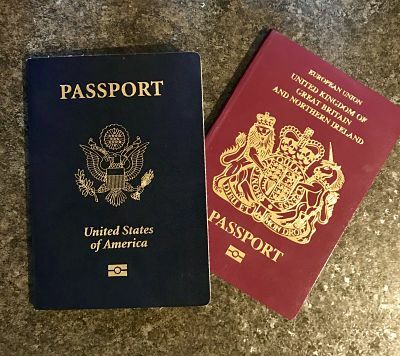 Having lost my own New York accent gradually over the years, sometimes it feels like the only part of me left that’s still American is the blue passport in my drawer. Cate continues: “I really struggled internally about getting my citizenship. I don’t identify as British, I’ve always felt like a settled American in Britain. Getting my citizenship felt permanent to me. My whole adult life, I’ve been foreign. Whether it’s not quite fitting in to the UK because I sound different, or being seen as foreign by my own friends and family back home because I’ve picked up British phrases and colloquialisms, I’ve not just felt ‘normal’ for a very long time. I was wary about how my citizenship would change that. I don’t think that was helped much by my friends and family in the UK saying ‘Well, you’ll be British now’. I didn’t, and still don’t feel ‘British’. I don’t sound British. I think by resolving it I had to remember that it was a formality for me. It meant that no one could ever make me feel anxious about my immigration status in the UK again, and that perhaps I would feel better about politics and government, knowing that I could start to do my bit to make a difference. And I wouldn’t have to sit in one of those hideous lines at the airport anymore. And let’s be honest, by choosing to live in the UK for the last 12 years, I kind of have pledged allegiance“. I ask Cate about her citizenship ceremony and she tells me: “My ceremony was in December 2017, and I felt really apprehensive in the lead up to it. My husband unfortunately wasn’t able to come because of an international work trip, so two of my best friends from University decided to be there to support me. I was excited to finally be at the end stage, after so many years and so many thousands of pounds spent on immigration. I never had to worry about how the government’s immigration changes would affect me again. But would it make me feel less American? Would I no longer be able to say with such confidence that I was American? I wasn’t sure if it would taint any of my American-ness if that makes sense. The ceremony itself was actually quite emotional, as one of the Deputy Lieutenants for the West Midlands was an immigrant herself. She showed such empathy for the struggle that everyone in the room had gone through and the opportunity this brought to us. She really validated what a tremendous achievement it was. My girlfriends both made such a special day of it, going out for cocktails and lunch as well“. We’ve invested a lot in our lives here and they really are here when I think about it. My husband and I started our married life here. My children were born here. We have paid through the roof for visas and ILR for the privilege to be here. And of course, I finally got a Land Rover!”. She continues, “My husband and I both travelled extensively (domestically and internationally) as children and into our adult lives before coming to the UK., but England has still opened a world for us that we wouldn’t have known existed without living here. It has had a large part in moulding us into the people that we are today. For all of that, I am grateful“. Christina adds: “Don’t get me wrong. I am proud to be American. I am grateful for my country and I proudly defend it almost daily. I flexi-school my children, and do an American curriculum on the days they are with me because of how important it is to us that they understand the incredible history and amazingness of the country that they are a citizen of, that they hold a passport for, that they explore a few weeks a year, and for a country where their entire extended family lives. I think we live in a state of confusion. When we get on a plane to fly Stateside we say we are ‘going home’, and then when we board a plane to fly to the UK, we also say ‘we are going home.’ But I also think we are extremely blessed, to be able to say that we are home in more than one place, in more than one country, on more than one continent. That is why we are applying for citizenship”. It’s these final words from Christina that have got me thinking that dual citizenship perhaps does make sense emotionally, not just practically. She tells me, “We will be truly home whichever side of the Atlantic we are on. I will always consider myself to be an American, but with the extra privilege of also being a citizen of the UK. God Bless America and God Save the Queen!”. Tax Assistance - 8 Companies Who Can Help! Our US tax advisory team, based in Lond on and the US, are able to advise clients with US connections, wherever they are based and on all US tax related matters including US estate tax planning and filing obligations associated with non-US companies, partnerships and trusts. Please contact any of Mark Walters, Andrew Harrison or Scott Wickham who’d be delighted to help. Expat Tax Professionals was founded by international tax experts with extensive American tax code experience. We don’t outsource anything to contractors - we only have our own seasoned, licensed CPAs and tax attorneys preparing and reviewing every tax return. With Expat Tax Professionals, you have the convenience of being able to handle your taxes completely online or working directly with a seasoned CPA for more complex tax needs. The US Tax & Financial Services specialist team of cross border advisors provides tax advice, guidance, planning and compliance services for individuals, partnerships, corporations, trusts and estates for anyone subjected to the US tax system, wherever they may be in the world. Established more than 30 years ago, US Tax & Financial has offices in London, Zurich and Geneva with clients in more than 32 countries. We also have dual handlers to manage individual tax obligations for US/UK taxpayers. The international aspects of the US tax system are extremely complex; not only are the statutes and regulations alien to US-based firms, but the additional informational returns relating to almost all aspects of an expat’s international lifestyle are complicated and carry stiff penalties if not filed correctly. Many of us here at US Tax & Financial are dual nationals and our offices are outside the US. We live and work here with these international issues daily. International taxation. Admittedly, not the sexiest of topics for most people. But we at Esquire Group aren’t most people. Not only is the team at Esquire Group dedicated to international taxation, with specialised knowledge drawn from years of experience, but we also know first-hand what running a successful global company entails. With offices in multiple countries, we recognise the actual challenges of conducting international business, from cross-border tax issues down to managing multiple languages, currencies, and time zones. And, since many of us live as expats or as members of multinational families ourselves, we understand the realities of those challenges as well. In other words, we get it. For almost 15 years, Esquire Group has been helping clients navigate the complicated world of international tax matters. Because we are a boutique firm, we provide our clients with the kind of highly personalised service you won’t get from sprawling corporations. You’ll get to deal directly with our experts and dedicated in-house employees—who have been carefully selected by founder and CEO Jimmy Sexton, LL.M.—instead of being relegated to seasonal contractors. Interested in having us prepare your tax return? Click here to get a quote. From our home in Southern Florida, Hayden T Joseph & Co, first expanded to the UK in 2011 and now has a presence in Dubai and 12 countries in South East Asia. Our firm's expertise extends beyond individual tax returns to more complex situations such as estate taxes, trusts, gifts and entity returns. We have many private clients with closely held companies and can assist with transfer pricing, structuring, business expansion or investments into the US, Dubai or Asia. Finally, we are IRS Certified Acceptance Agents so can assist with ITIN applications. Send us an email and let's setup an introductory call today! Expatriates have special tax considerations both at home and abroad. The complexity and constant change in tax laws and regulations demand a higher level of knowledge and service. It is important to work with a Certified Public Accountant knowledgeable of the unique reporting requirements facing US citizens residing abroad. The penalties are too significant to risk. We make the tax compliance process as easy and painless for you as possible. We offer free consultations and up-front pricing. Locations and time zones are not a hindrance, we have clients around the world, on six of the seven continents. We have systems established and in place to work with clients around the world. This includes a secure client portal for uploading documents. Contact us today for a free consultation to discuss your filing needs. As an American living abroad your financial life is probably subject to many complexities. You may also be experiencing a reluctance from financial organisations to take you on. We are one of the few firms in the UK happy and able to provide you with the service you may be looking for. •	Business and employee benefits advice. The content of this blog is informative and entries are not a recommendation by The American Hour.